At a time now when inspiration shoots are a dime a dozen, I choose my shoots very carefully. When McKenzie asked me to join her team for this shoot at the ice castles I didn't have to think twice! I mean an ice castle?! It's other worldly! Not to mention in a few short weeks it would be gone, melted into our memory. For the shoot I wanted a bouquet that would match the simple continuity of the castle that rises into a giant wonder. Enter the composite rose! Composite rose is the term for ripping petals off dozens of roses and gluing them back together to make one giant rose. It's a daunting and time consuming project. I had tried it once before and the rose turned out too flat. FAIL. Which I recently learned is just the First Attempt In Learning. With that first attempt under my belt and some creative engineering I crafted a bouquet holder that would give me added depth. Success! The group of ladies that worked on this project were phenomenal! I had never met them before and the scene they brought together created pictures that I'll treasure forever. See all involved listed below. Last week I did a little feature on Channel 2's Fresh Living. We talked about the language of flowers, what certain Valentine bouquets mean, and ended the segment making a single rose bouquet. Being on TV was a fun new experience! You can see the video here. We have a spread in the winter/spring issue of Salt Lake/Park City Bride & Groom. It hits news stands today! In May we threw our first Wednesday Wedding! The Wednesday Wedding is a bridal fair alternative in the form of a big, fat, fake wedding. It was a very fun evening! Enjoy the video below and visit the website for more info! I stumbled upon this video about Bulgarian rose oil production the other week. It made me think about how little I know about the production of many things that are part of my daily life. And if it weren't for the "Made in China" tag I wouldn't know where anything came from either. I am even subject to this with flowers, my own art medium. I can't tell you how many times I have opened bundles of daisies, roses, lilies, snapdragons etc. and not even looked to see where they were grown. Those flowers started somewhere, by someone and wouldn't it enrich the bouquet I create with them if I knew that back story? I'm crazy about flower crowns ever since we did this shoot. Nothing is more feminine, romantic, nor royal! To inspire and encourage more flower crowns at weddings..hehe..I pinned my favorite crowns. Check it out! 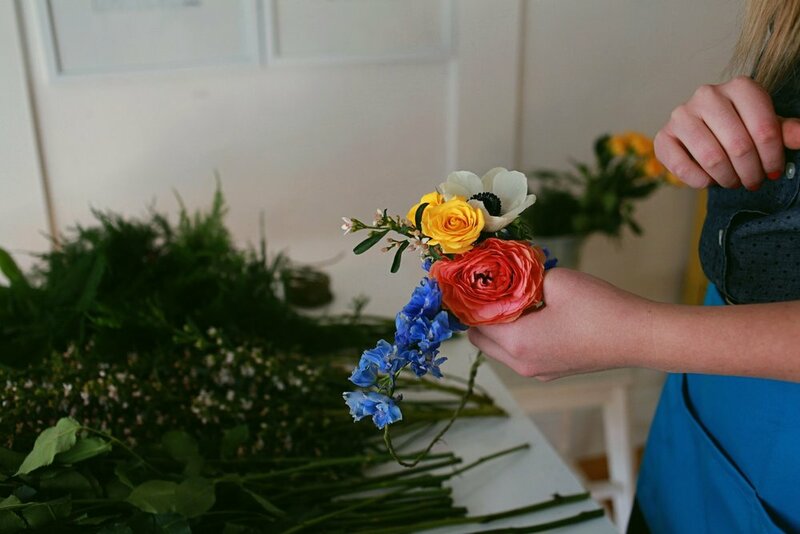 I am pretty smitten with Floret Flower Farm. Erin Benzakein has truly inspired me with her Skagit Valley flowers! Her picked from the fields bridal bouquets are the most beautiful I have ever seen. She includes so many varieties of flowers that I can't get in my flower markets. I have spent many nights now devouring the archives of her flower journal. The pictures of farm life give me goose bumps and make me so excited for the future. She also keeps it real and reminds me that farming is hard work and I get worried. Really worried. Enjoy just a few more pictures before heading over to read Erin's farm journal. It's a must read for any flower enthusiast. You'll fall in love with Erin, her family, and their flower farm! Welcome Monday! Said no one ever. We're already looking forward to this weekend and the Easter holiday. You have six days to plan for food, baskets, eggs and the perfect table setting. Overwhelmed? We're here to help with the table! Check out the cute ideas on our Easter pin board. You've made it to Friday! This week I stumbled upon photographer Georgianna Lane. Her flower photography is the best I've seen! Granted she is great friends with Floret Flower Farm owner Erin and has a pretty great supply of flowers to shoot, but still! (More about Floret next week!) I think what I like most about Georgianna is that she styles the flowers in her shoots. She arranges the flowers, shoots them, takes them apart and does it all again over and over. I've always thought creativity in one art leads to creativity in another art and she is proving my theory right. Enjoy these spring daffodils and see more of Georgianna's photography on her website! Be warned- I've spent many hours looking through the archives! Put some daffodils into your spring! We've found lots of ideas to inspire you on Pinterest. The Daffodil aka Jonquil aka Narcissus is March's birth flower. The trumpet shaped flower means friendship and domestic happiness. It is the official flower of Wales and is said to be poisonous if eaten. Beware! Today we're going back to 2012. Aubrey and Eric were married the beginning of last April. Their wedding perfectly matched early spring weather. The chartreuse greens, smoky lavenders, and silky grays hinted to new life creeping out of winter's sleep. To see more pictures go to Elisabeth Kate Photography. Enjoy looking forward to April!